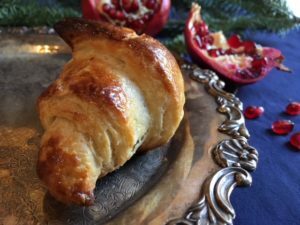 2017 Update: I first published this recipe in 2009, at which time we’d been making croissants for three years, so it looks like it’s been a family tradition for more than a decade now. It’s nice to see things you’ve come to know and love have longevity; I remember when we began creating the traditions that we wouldn’t do without, after years of sad, stressed, miserable Christmases. Now it’s a time of year we all look forward to, which is the best thing. I’ve edited the recipe slightly to fit my current recipe format and make it easier to read and work with. 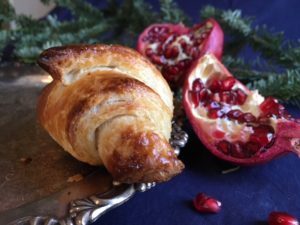 Original post: Croissants have started to become a Christmas tradition in my family – having fresh-from-the-oven croissants as part of our family’s Christmas brunch is something we all look forward to. Because croissants take three days to make (but probably less than 2 hours over those three days, so the work is actually minimal) I start them on December 23 in order to have them in the oven on Christmas morning. 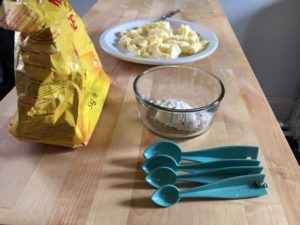 I rarely make them at other times of the year – I like to keep special treats separate from my normal baking – but they’re excellent, and you could make them every week and never tire of them. One thing I’d recommend is to keep a weather eye on these as they bake – I’ve been making them for years, but this year is the first time the bottoms weren’t burnt, and that’s because I parked myself in front of the oven and pulled them out as soon as they looked cooked. 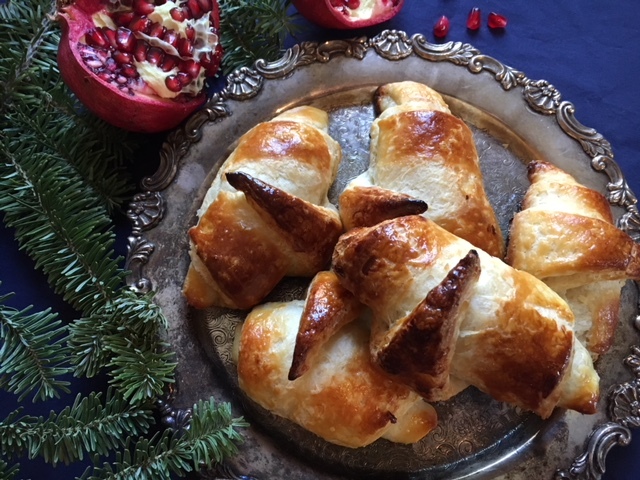 Served up with cherries and a selection of cheeses from our local cheese shop, Chasing the Cheese, these croissants are the perfect Christmas morning indulgence. Note: Normally I’m pretty lax about switching salted butter for unsalted, but I always use unsalted butter for these. Also, the photos are in order, but they are all the very last day – so all of these photos were taken on Christmas Morning at my mom’s house. You won’t use these all in the first evening – the daily steps are broken down below with the ingredients you’ll need for each step. Dissolve yeast slowly in 1/4 cup of warm milk – it will probably not dissolve entirely. Try not to let it lump together. Measure out 2 ¼ cups flour and take 2 Tbsp of flour from this amount. Add 2 Tbsp of this flour to the milk and yeast. Whisk until smooth, and then cover with plastic wrap. Set aside for about 20 minutes or until it approximately doubles in size. Mix the sugar and salt with the remaining 2 1/8 cups of flour. Transfer the raised dough of milk, yeast and flour to the mixing bowl. Warm the remaining ¾ cup of milk and add it to the bowl. Gradually add in the mixture of flour, sugar and salt. 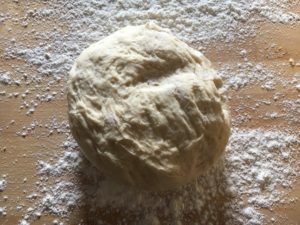 Mix until the dough is sticky and soft. Get the butter for tomorrow out now (3/4 cup), so that it’s room temperature in the morning (butter will keep unrefrigerated for about two weeks, so it’s safe overnight). 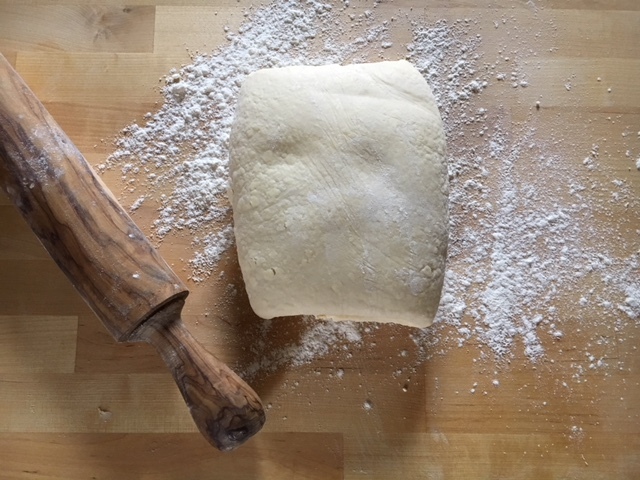 In a mixing bowl or plate, using your hand to knead the flour into the softened butter until fully blended. Sprinkle your work surface with a layer of flour flour. 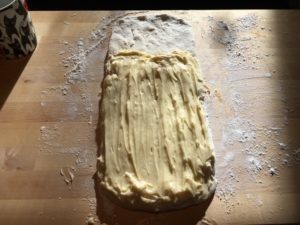 Remove the dough from the fridge and begin to shape it into a 6 inch x 15 inch rectangle. Spread the butter on the top 2/3 of the rectangle of dough leaving a ½ inch border around the outside. Fold the dough like a letter, folding the bottom 1/3 up first and then the top 1/3 down. Turn it counter clockwise so the open flap is to the right. Roll it out to a 6 inch x 15 inch rectangle and fold again. Transfer to a baking pan, cover tightly with plastic wrap and put back in the fridge for about 6 hours (a bit longer is fine – I’ve gone as long as ten hours). Remove the dough from the fridge, place on a floured work surface. Roll out the dough and fold just like during the morning. Do this two times, wrap it again and refrigerate it overnight. Start this process roughly 2 hours before you want to eat the croissants – I often push it a bit, but we have a pretty leisurely Christmas Morning, so not too much. Roll it out to a 16 inch circle. 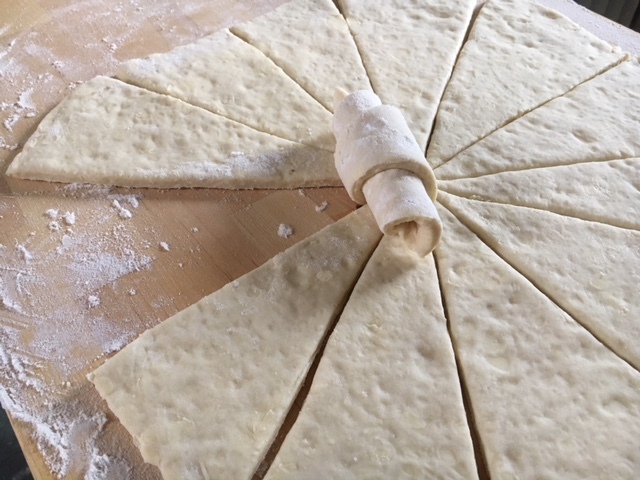 Cut the dough into quarters and each quarter into 3 triangles. To make each croissant, roll the wide base of triangle toward the corner. Transfer each one to a baking sheet lined with parchment. Brush with milk and then let them stand for about 45 minutes. They should double in size. 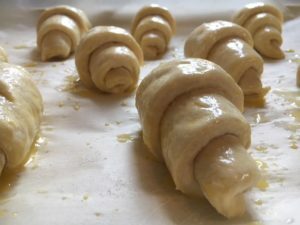 Brush each croissant with the egg, milk glaze (if you wish – I generally skip this step). Bake for 15 to 20 minutes. Keep a sharp eye on them – I find the bottoms tend to burn quickly. If they brown too quickly lay a piece of foil over the top during baking. Let them cool 20 minutes before serving.